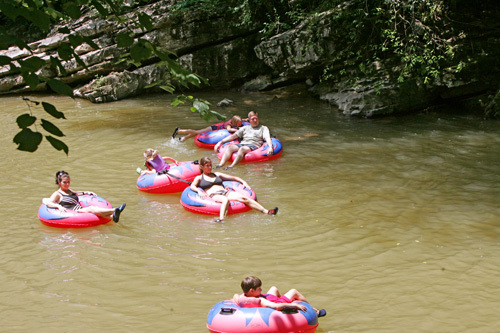 River Romp Tubes and Kayaks Rentals features tubing in the Smokies, with a convenient location less than five miles from Dollywood. Each tubing trip takes approximately two hours, depending on river conditions. Your tubing experience begins at the Barn and goes approximately 2.5 miles where you exit to a pavilion with a phone that is hot-lined to the office. One day Kayak rental includes two trips and all day tubing. Life jackets and shuttle provided. Fun for the entire family! Perfect summertime activity for families. Tube down river 2.5 miles. Kayak rentals include all day tubing (max weight 225lbs per kayak). Each trip takes about 2 hours. Arrive early in the day to allow enough time for multiple trips down the river. Life jackets and shuttle provided. Located less than 5 miles from Dollywood. 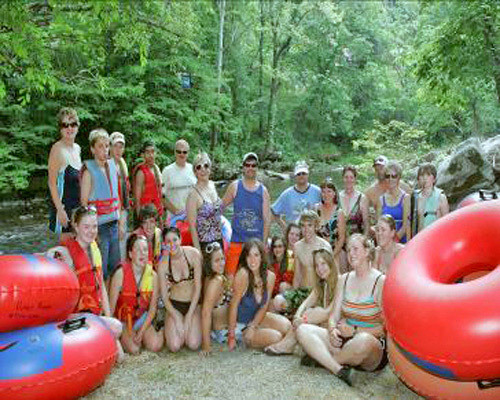 River Romp Tubes and Kayaks Rentals features tubing in the Smokies, with a convenient location less than 5 Miles from Dollywood. 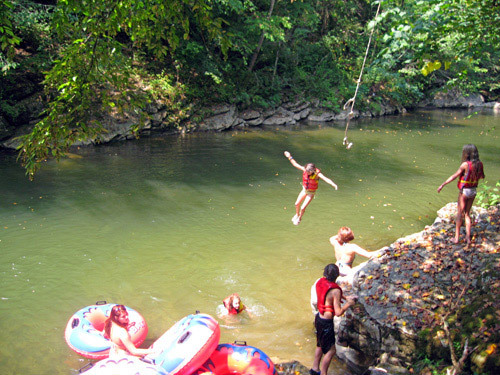 The Smoky Mountain River Romp was listed in the book 100 Secrets of the Smokies’ as Secret number 50. It’s no secret, though, that a day with the River Romp tubing the river is great fun. 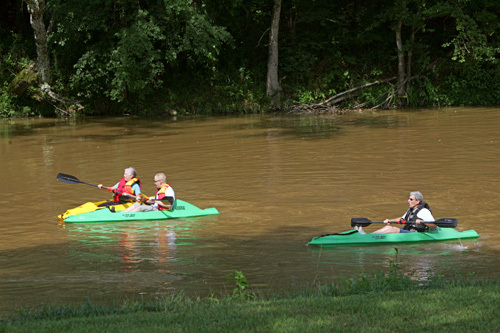 Each trip takes approximately two hours, depending on river conditions. We shuttle you back from your trip. Afterward, you can enjoy a picnic on our grounds, fish or take another ride down the river at NO ADDITIONAL charge. You can ride all day! 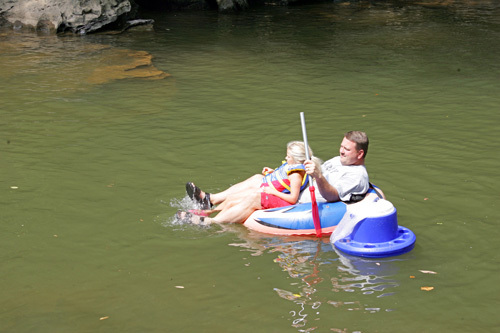 The River Romp is a family owned attraction in its 25th year in the water recreation field. 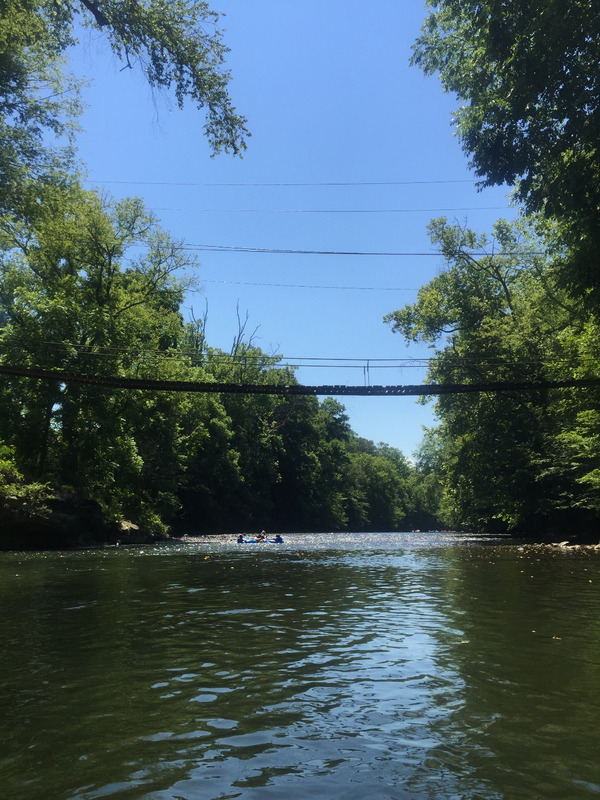 We are located on the Little Pigeon River, less than five miles from Dollywood’s Splash Country, yet it offers the scenery and peacefulness of a secluded mountain river. Your tubing experience begins at the “Barn” and goes approximately 2.5 miles where you exit to a Pavilion with a phone that is “hot-lined” to our office. Once you identify yourself, we dispatch our courteous driver, who will pick you up within minutes and return you to the “Barn,” where you can get back in the River, picnic, leave and return (prior to 4:00 pm) and take another ride. Children 2-4 are welcome to tube with us free of charge; however, they must ride in the same tube with an adult. Children 5-17, as well as all adults, are welcome. We are honored to say we have been blessed to serve the needs of numerous mobility challenged individuals due to our easy access to the River and exit from the River. Although we have no height, weight or ability restrictions, we will advise our customers of the daily River conditions to the best of our ability, including shallow and deep sections. Our Family has deep roots in Safety and Service. YOUR SAFETY & ENJOYMENT ARE OUR PRIMARY GOAL. In addition to the continuous monitoring of local and national weather, our entire Staff has received numerous Safety classes, including, but not limited to CPR and lifeguard training. We not only provide U.S Coast Guard approved life jackets, we require ALL MINORS to have a life vest and offer them to all adults (Of course there is NO ADDITIONAL CHARGE for life vests!) as well. Our Season runs from the Friday of Memorial Day Weekend through Monday of Labor Day Weekend. Additionally if weather and River conditions permit, we will be open on weekends in May and September. We are conveniently located at 1980 Pittman Center Road, Sevierville, TN (Sevier County). Only 4.5 miles from the Dollywood Entrance on Veterans Blvd. From the Dollywood Entrance on Veterans Blvd. proceed to the next Red light (Jayell Rd) - take a right and continue on Jayell (exactly 3 miles long) till you reach the only Stop sign at Pittman center. Take a left in front of the Citgo gas station and go 2/10ths of a mile - where you will see the gray "Barn" on your left. Pull in and leave the rest to us! What River do you tube/kayak on? Are there any age, weight or ability restrictions? Kayak Rentals' maximum weight is 225lbs per kayak. 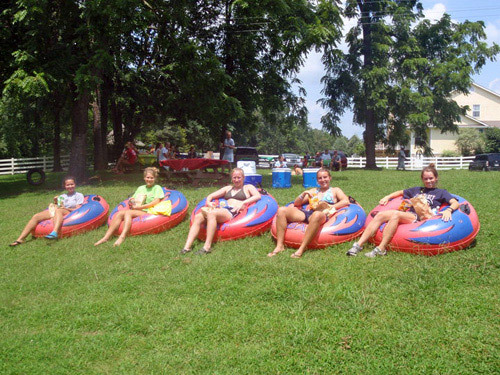 Tubing — Children 2-4 are welcome to tube with us free of charge; however, they must ride in the same tube with an adult. Children 5-17, as well as all adults are welcome. Is there any reason you will close? Two years ago East TN suffered one of the worst droughts in nearly 100 years. We opted to close 32 days of our 102 day Season, rather than have our guest “carry” their tubes down River. Additionally, we monitor several local weather stations, the National Weather website, and a Federal website that monitors rate of River flow per cubic foot and River height. We will apprise our guests of River and Weather conditions to the best of our ability and prefer to close, than possibly remotely endanger our guests. Can I bring a cooler? Can I reserve a float for my cooler? Customers are not allowed to bring their own coolers. 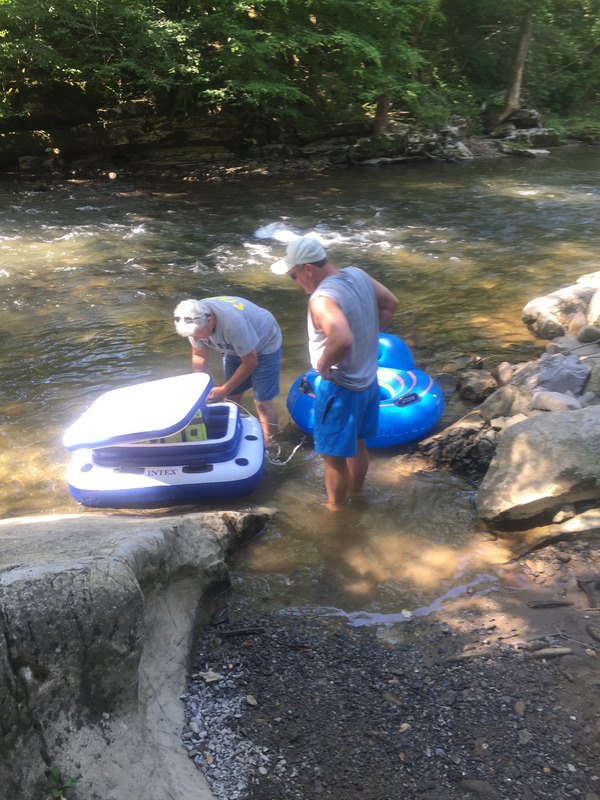 Guests may rent specialized floats with coolers. These particular floats are in limited supply. Guests may call ahead to reserve a cooler float.